Maui, the second largest island in Hawaii measuring 1883.5 square kilometres, has a variety of landscapes ranging from the arid volcanic terrain to lush jungles and has equally diverse climatic conditions. Maui also happens to be the largest sugarcane producer in Hawaii, and of course we all know what that means – RUM! Maui Rum is handcrafted by the master distiller Jim Sargent or Braddah Kimo at Haleakala Distillers from locally grown long maturity sugarcane that takes up to two years to grow to a height of sometimes over 3.6 meters. The family owned distillery, where Maui Rum is produced is located on the Haleakala Ranch, which is a 30,000 acre cattle ranch established in 1888. The distillery itself opened in 2003 producing rums from Maui molasses and is a joint venture with the ranch. 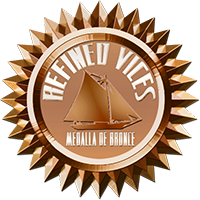 The molasses are fermented at an altitude of over 600 meters above sea level where the temperatures are slightly cooler, therefore prolonging the fermentation by a day or two when compared to most sea level distilleries according to Kimo. All Maui rums start with the same fermented molasses base and after the batch has completely fermented it is time to distil the molasses in copper stills handmade at the distillery. 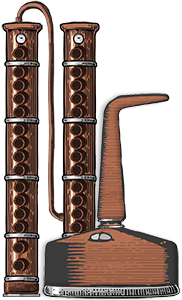 At Haleakala distillery they use a double distillation method where the first distillation is in a copper pot still followed by a hybrid pot-column still, which produce a high proof spirit used to make all of their products. For Maui Platinum Rum, this spirit is aged in once used Jim Beam bourbon casks for less than a year. None of the Maui rums are blended and are in fact, single barrel rums. If you notice a significant change in flavour in any of the Maui rums, this would most likely explain why. The final step in the process is filtering, which is done through carbon made from crushed coconut shells, followed by a plate and frame filter unit. In the case of Maui Platinum Rum, no caramel is used to adjust the colour. 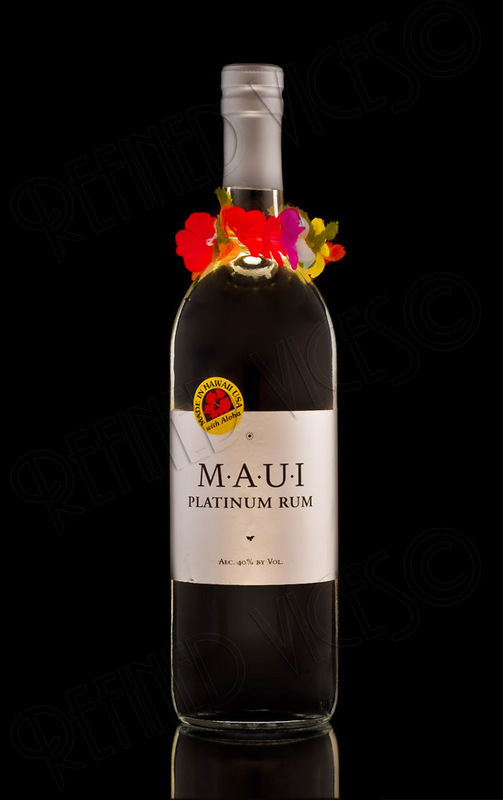 Maui Platinum Rum comes in a standard, clear, silver labelled bottle with a colourful lei around its neck. On the label there is a yellow stamp with a funny caption “Made with Aloha.” It is not the most striking of bottles, but it does hold the liquid at least. Several thin legs form on the walls of the glass creating bars and droplets and the rum holds perfect clarity like that of pure water. Warm aromas hit the nose with a sharp sting from the alcohol with some tropical fruit, coconut and vanilla. To the mouth the rum is extremely smooth with light buttery flavours. After swallowing there is a minor alcohol flavour finished by a buttery, candied toffee flavour. Maui Platinum is not a very rich or complex rum but it is easy and simple and I could see myself using it as an ingredient in light and refreshing cocktails such as the Mojito or Daiquiri.